From the city of Corfù, an open air museum with its historical and architectural wonders, to the wonderful landscapes of Paleokastritsa where an exciting boat trip will lead us to the discovery of its mysterious caves. We visit the historic centre of Corfu, an open-air museum and a UNESCO World Heritage Site. This fortified Mediterranean port city is authentic and beautifully preserved. We enjoy a walk through the labyrinth of streets with elegant buildings and craftsmen's shops, arriving in the Spianada, one of the largest squares in Europe where cricket is still played. We pass the elegant Liston, in the past only accessible to the Corfu aristocracy listed in the "golden book". We then arrive at the church of St. Spyridon, the island's protector, and the City Hall. 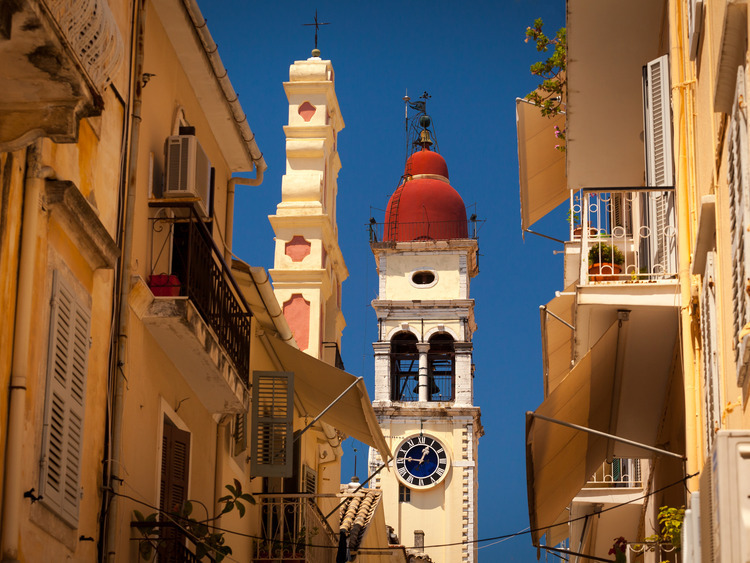 The Venetian atmosphere of the historic Campiello district of Corfu, where narrow streets flow into characteristic squares, is truly surprising. Having immersed ourselves in art and history, we enjoy the enchanting views of Paleokastritsa, famous for its idyllic bays lapped by the emerald-green sea, its mysterious caves and fascinating rocks. According to Homer, archaeologists believe that the legendary castle of King Alcinous was located in this town. Our boat, waiting for us in one of the bays, will take us to explore the three magnificent caves, Nafsika, St. Nicholas and Blue Eye, before we admire the indented coastlines from the other side of Paleokastritsa. After the exciting boat trip, we cannot miss the opportunity to take a dip in this beautiful sea or enjoy a walk in the magnificent village of Paleokastritsa. Places on this excursion are limited, so please reserve early. Comfortable shoes and clothing are recommended.? The boat ride doesn’t foresee a guide.